You meet someone new and in a matter of seconds they make up their mind about you. They’re responding to your Presence: what people see when they look at you, what they hear when you speak, and how they feel when they’re around you. If you’re not thrilled with the responses you’re getting – if you don’t attract clients the way you’d like to … if you didn’t get the promotion you wanted … if you don’t make the money you ought to be making – it may very well be because you’re missing that powerful presence. The good news is: you can change the way you’re perceived. And THAT can change everything. 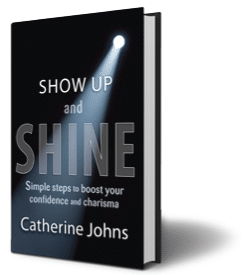 In Show Up and Shine, Catherine Johns explains in practical, concrete ways, how to use your body and your voice to create more confidence. You’ll discover how to increase your charisma so you become more magnetic in business and in your personal life. This book addresses specific issues that confront women, habits that have been ingrained in girls for generations, barriers that keep females from playing full out. Read it. Practice the Action Steps. And learn how to shine.